What Could Brexit Mean for Golf in the UK? It is the subject nobody really wants to talk about but cannot avoid - Brexit. To date, Golfshake has remained a relatively Brexit-free zone but writer Derek Clements decided that perhaps the time had come to dip our toe in the water and have a look at how it might impact on golf. There have been concerns over what will happen to European footballers playing in the Premier League, and there may be some of the more observant of you who have wondered about the Ryder Cup, especially since the European team plays under the EU flag and colours. Not to mention the fact that the EU anthem is traditionally played at the contest. Well you can relax. Nothing is going to change. British golfers will continue to be selected for Europe if they are good enough because team selection is based on geographical, not political borders. A spokesperson for the European Tour said: "The criteria for being European in Ryder Cup terms is a geographical one (ie from countries who make up the continent of Europe) not a political or economic one (ie countries who make up the EU). In terms of the flag flown to represent the European Ryder Cup team, we consider that the blue and gold flag of Europe represents the continent of Europe and, as a broad symbol of Europe as a whole, we therefore plan to continue to use it." Besides, it wouldn’t be practical for the anthems of every individual representing Europe to be played at the opening ceremony. If they did so, it would take longer than the match itself! But it will seem somewhat incongruous in two years time so see the likes of Tommy Fleetwood, Tyrrell Hatton and Justin Rose all standing to attention on American soil under the EU flag, don’t you think? Brexit will not stop golfers from the EU or anywhere else in the world participating in The Open. On the other hand, if free movement is restricted, European golfers who want to base themselves in the UK, as well as officials, caddies and other support staff associated with the golf world may well be affected by new rules. 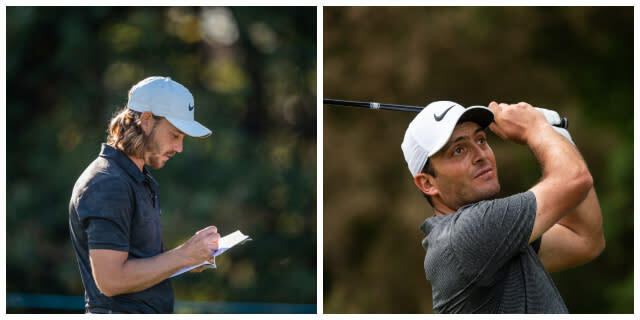 Open champion Francesco Molinari is an Italian whose home is in London. Would we really ever ask him to leave? Members of the European Tour receive their prize money in euros, not pounds, so if the pound should plunge it will not see them being hit in the pocket. But that is unlikely to be the case for British club golfers, who will almost certainly find that golf trips to Europe will be more expensive and will probably involve a good deal more paperwork and admin after March 29, 2019. The other side of that coin is that the UK has become much more affordable for foreign golfers – especially those in the US – potentially leading to a flood of golfers visiting Britain’s historic courses. There is already evidence that the numbers of American golfers coming over here is on the increase. Dozens of EU directives are also likely to come into force during the Brexit transition. One new law to be introduced by the EU requires people to insure all off-road vehicles, including tractors, mobility scooters and even golf buggies. This is a subject we will be returning to again in the months that lie ahead as things become clearer.